TheWaste Oil Managementoffered by us is rated among the best in the industry for their outstanding technical features and efficient performance. The range offers solution to oil industry foreffectivereuse of waste oil and thereby saving on precious oil and putting it to good use. Our system is based on most advanced technology that makes the product highly efficient. Creating a niche of Waste Oil Management System such as Oil And Grease Trap, Fresh Oil Dispensing System, Oil Drain Tank, Oil and Grease Separation Units, Oil Skimmer and Remover, Oil Skimmer and many more items at its best, with utmost quality. We are offering Oil And Grease Trap. We “Ventilair engineers" is also leading manufacturer & supplier of Oil and Grease separation units. We manufactured & installed this type of project. 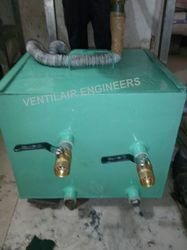 VENTILAIR ENGINEERS is leading manufacturer, supplier of effluent & sewage treatment plant in India. “Oil and Grease separation units are basically a important part or waste water treatment plants. We have installed many plants such as this type. Simply put, a grease trap is a receptacle that kitchen wastewater flows through before entering the sanitary sewer lines. This receptacle technically defined as a grease interceptor interceptors, captures, or "traps" grease. How? Grease, the industry term for animal fats and vegetable oils, is 10 to 15 percent less dense than water. Grease also won't mix with water. As a result, fats and oils float on top of water. When kitchen wastewater flows through a grease interceptor, the grease and oils rise to the surface inside the trap and are trapped using a system of baffles. The captured grease and oils fill the trap from the top down, displacing “clean” water out of the bottom of the trap and into sewer line. Peer into a grease trap and you will see a mat of grease. When this mat of grease gets deep enough, the trap must be cleaned out. A single unit elevates and separates oil & grease. We are offering Oil And Grease Trap with oil skimmer Ventilair Engineers is leading manufacturer, supplier of effluent & sewage treatment plant in india. 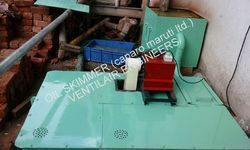 "oil skimmer is basically a important part of waste water treatment plants.we have installed many plant such as this type. We " ventilator engineers" is also leading manufacturer & supplier of oil & grease trap with oil skimmer. we manufactured & installed belt type oil skimmer with ss/ ms type grease trap . we offered grease trap with Oil skimmer which is a simple mechanism to remove or separate oil & grease from waste-wateranf easily collect in a seprate bin.. It is specially for (restaurant & automobiles) effluent-water and industrial oily waste-water. ventilator engineers have installed such type unit in various unit in delhi NCR. •A single unit elevates and separates oil grease.